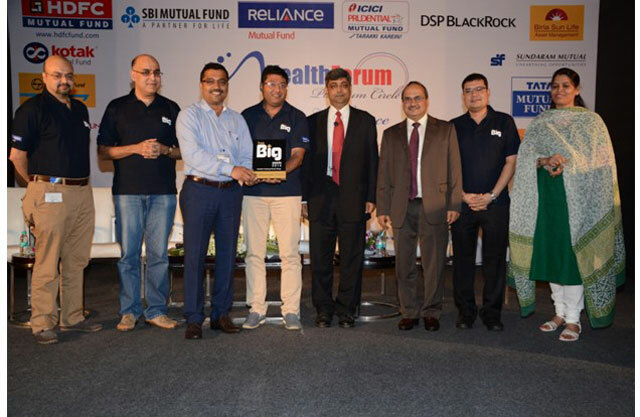 The second edition of Think BIG awards, presented jointly by Reliance MF and Wealth Forum, are aligned completely with the 5 pillars of growth that Think BIG articulates, as the best way for any IFA to scale up rapidly. Check out the winners and their achievements in each of the 5 pillars, and get real life examples of IFAs who thought BIG and achieved BIG. Wealth Forum congratulates this year's winners and sincerely hopes that their achievements will motivate every IFA onto the path of sustainable high growth. The core proposition of Think BIG is to encourage and enable IFAs to rapidly scale up their businesses in a robust and sustainable manner. Think BIG encourages IFAs to discard an incremental approach to growth and shoot for quantum leaps instead. For any IFA to think in terms of growing from 1x to 10x, Think BIG proposes that he/she needs to work on 5 pillars of growth. The Think BIG microsite on Wealth Forum Ezine carries content and practical insights on these pillars, which will enable growth focused IFAs to embark on this journey with confidence. As a logical extension of these efforts, the Think BIG Advisor Awards, which we instituted last year, are also being dovetailed into these same 5 pillars. These awards recognize IFAs who have demonstrated considerable success in each of these 5 pillars and therefore serve as role models for the wider IFA fraternity. Our winner for this year's award for strategic vision started out as a two member team running an equity broking business in Kolhapur, Maharashtra in 1997. Undaunted by the relatively small size of the equity market, he decided to build an equity focused business differently. He created his own set of channel partners, whom he groomed, trained, gave leads, helped make viable, and then got them on their own to expand their franchises in various towns within a 200 km radius of Kolhapur. Today, his firm employs 100 people across 9 branches in Southern Maharashtra, has 22 active franchisees in the region and handles client assets in excess of Rs.800 crores - 200 crs in mutual funds and 600 crs in equities. His firm serves over 15,000 clients, 5000 of whom own mutual funds. 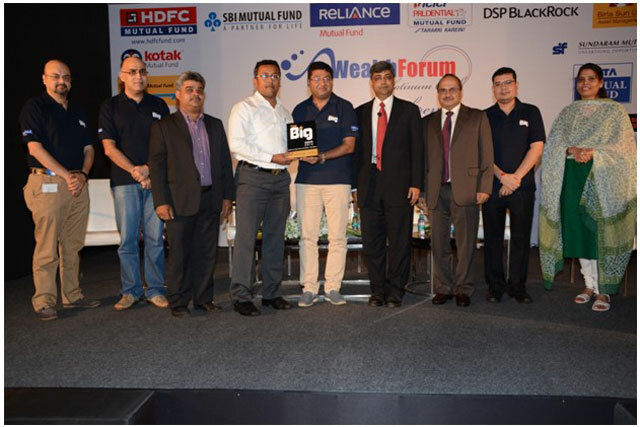 For his strategic vision of seeing a BIG market opportunity that few believed even existed in and around Kolhapur, and for pursuing his vision and executing it so successfully, the Think BIG Advisor Award for Strategic Vision goes to Samir Kulkarni, TradeNet Stock Broking, Kolhapur. 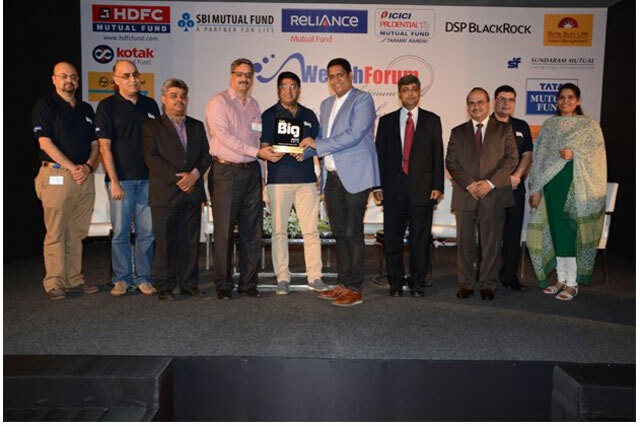 Samir Kulkarni (third from left) receiving his Think BIG award from Himanshu Vyapak, Deputy CEO, Reliance Capital AMC and Vijay Venkatram, Wealth Forum. Team RMF applauds Samir's efforts. We have created 2 awards in this category - one for metros and one for small towns, as the content and delivery of advice varies sharply between more sophisticated markets and developing markets. Our winner this year for advisory excellence in the metros category is a gentleman who has perhaps found the holy grail of equity advisory. Every advisor wishes to upskill him/herself to become a more effective advisor - one who can deliver healthy returns in client portfolios and help clients achieve their financial objectives. An ability to protect capital in downturns and create wealth in upturns is the holy grail for any investment advisor. One advisor who has mastered this skill, through a strikingly unique approach to portfolio construction, based on deep research and insights, is a leading advisor from Kolkata. His intensive research into market cycles and sectoral trends through market cycles have enabled him to come up with a unique portfolio construction strategy where select sector funds become core portfolio holdings, thematic funds become satellite funds with shorter term perspectives and diversified equity funds are relegated to the background. His unique portfolio strategy has stood the test of time, helping him deliver robust returns in client portfolios in sideways markets and has helped protect capital even in the most severe of downturns. His clients are all very happy with their equity fund experience - because the skills of their advisor have enabled them to make money even in challenging times. This year's winner of the Think BIG Award for Advisory Excellence in metros is Kishore Kewalramani, Kolkata. 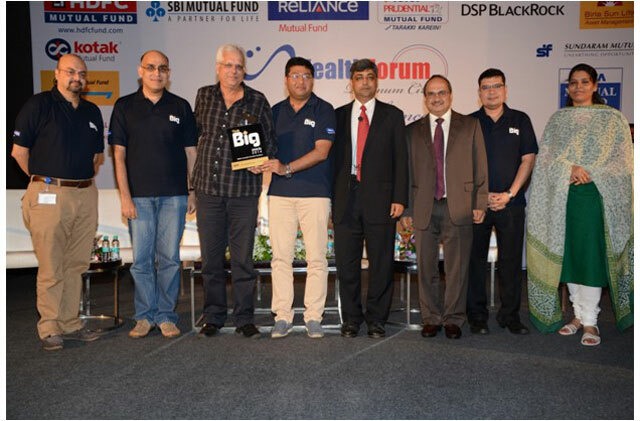 Kishore Kewalramani (third from left) receives his Think BIG award from Himanshu Vyapak, Reliance MF and Vijay Venkatram, Wealth Forum. Our winner in the smaller towns category is an advisor from a small town in Karnataka, called Davangere, which has a population of 6 lakh people. Undeterred by the size of his market, he nevertheless is passionate about first upskilling himself and then imparting effective education to retail investors. He completed his CFP in 2011 and has been conducting weekly investor education programs long before SEBI put a spotlight on this activity. His focus on education has resulted in his AuM increasing steadily from 80 lakhs in 2011 to over 10 crores now, with a SIP book in excess of Rs. 9 lakhs per month. He has constructed 80 financial plans and has got clients comfortable with using his website for a number of service issues. For his efforts in upskilling himself and his clients, unmindful of the challenges of operating in a tiny market, the Think BIG Award for Advisory Excellence (non-metros) goes to Ramesh Hegde, Davangere. Building a sharp process orientation is vital for any firm to scale up, as everything that is done to serve clients must be broken down into repeatable processes that can be handled either by technology or a team or a combination. Adopting technology is a BIG way in which you can instill process discipline in your firm. Our winner this year is a firm in Bangalore that has understood this very well and is executing it very successfully, which is proving to be a significant growth enabler for the firm. The firm uses cutting edge technology in everything it does - from advising clients to back office operations - and a lot of it is inhouse development. Its PeakPlanner financial planning platform combines well with PeakFilter, its portfolio analytics software, to deliver to its clients seamless and high quality financial advice on a scalable platform. The best part is there are over a thousand active and happy users - clients of the firm who can access and benefit from this technology through a web-based delivery platform. For its excellence in adopting technology to deliver high quality advice and service to its clients, this year's Think BIG award for technology adoption goes to Shyam and Priya Sundar of Peakalpha Investment Services, Bangalore. 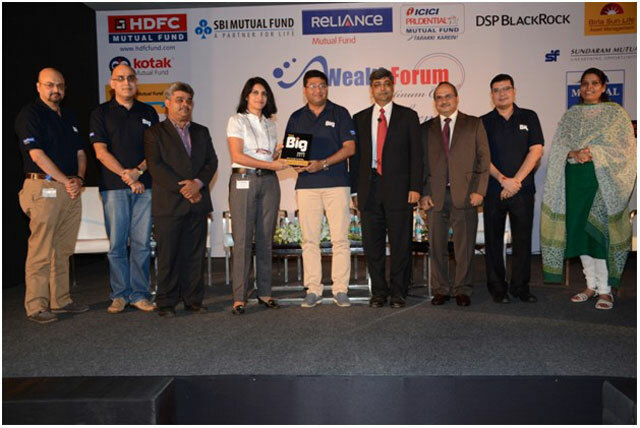 Shyam Sundar (4th from left) and Priya Sundar (6th from left) receive their Think BIG award from Himanshu Vyapak, Reliance MF and Vijay Venkatram, Wealth Forum. One of the biggest challenges for an IFA in scaling up is to build, motivate and retain a high quality team that can help him realize his growth aspirations. Advisors who are successful in this effort, see growth galloping far above their peers. Our winner this year for successful team building is a firm that not only achieved this feat of building a high quality team, but is perhaps unique in the entire industry as the only team that is a 100% all women team. With the help of 2 partners and 8 well trained, motivated and skilled support staff, the managing partner of this firm is blazing a high growth path in Delhi and Gurgaon. The amazing aspect of this team is how they perfectly complement each other and balance work and home responsibilities to ensure they give their fullest to their families as well as their clients. For building a formidable, high quality, all women team that is setting an example on driving business growth while maintaining a perfect balance between work and home, the Think BIG award for successful team building goes to Sapna Narang, Capital League, Gurgaon. Financial planning is seen as one of the best ways to help clients meet their financial goals. Fee based financial planning is high up on the wish list of most advisors, yet presents its fair share of challenges in execution. Its one thing to execute a fee based financial planning model in more evolved markets like metro cities where tens of thousands of professionals would be amenable to adopt this proposition. Its quite another execution challenge to do this in small towns and rural markets, where capital market products themselves have barely reached. Our winner of this award is a 29 year old financial planner who has defied all odds to successfully set up a 100% fee based financial planning proposition in a tiny town called Vita (Sangli district in Maharashtra) which has a population of only 30,000 people. He charges Rs.14,000 annually from all his clients for his financial planning services - and has a 100% record of annual fee collection from all clients in this tiny town. Seeing his execution of a fee based financial planning proposition in semi-urban markets, 20 distributors from southern Maharashtra signed up for a fee-based training program which our winner conducted, to enable them to understand exactly how he makes this work in small markets. 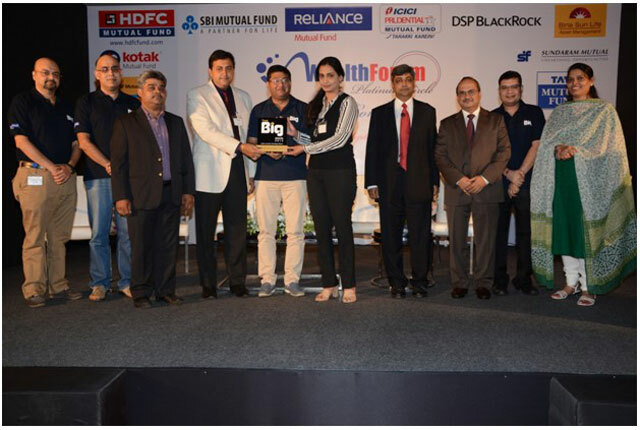 For his flawless execution of an evolved proposition in rural India, which many of his peers find challenging in much more sophisticated markets, the Think BIG Advisor Award for Execution Excellence goes to Nitin Sawant, Vita. 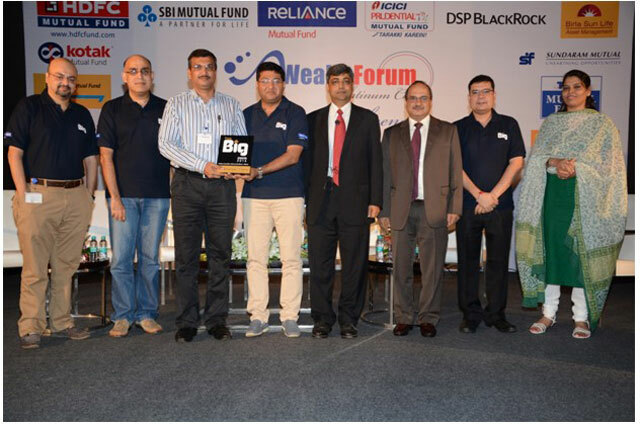 Nitin Sawant (4th from left) receives his Think BIG award from Himanshu Vyapak, Reliance MF and Vijay Venkatram, Wealth Forum. A group of Mumbai based IFAs got together, took a long hard look at how the financial advisory profession is developing, created a blueprint of what a Next Gen advisory firm should be capable of delivering to its clients to succeed in the emerging landscape, and went about creating a platform that aimed to serve the needs of this Next Gen advisor. Their platform is the first one by IFAs for IFAs, and has been built to cater to all the business sensitivities that IFAs usually have when considering platforms. This group of IFAs is moving now beyond a technology solution and is emerging as a formidable think tank and a change agent that is prodding IFAs to embrace best practices and be ready for tomorrow in every way. For their efforts in helping the IFA fraternity get ready for tomorrow, for catalyzing positive change in the industry, this year's Think BIG award for catalyzing industry change goes to Next Advisors. Its one thing to talk about the 5 pillars of Thinking and Growing BIG - its quite another to actually become a champion in each of these pillars and set a scorching growth pace. We hope our winners in this year's edition of Think BIG awards will inspire each and every IFA to Think BIG and focus on implementing the 5 pillars of growth, in a structured and systematic manner.